United Arab Emirates with its capital Abu Dhabi is located in Asia (Middle East, bordering the Gulf of Oman and the Persian Gulf). It covers some 83,601 square kilometers (slightly larger than South Carolina) with 6,072,480 citizens. Arabic, Persian, English, Hindi and Urdu are the common languages used in United Arab Emirates (consider regional differences). Interesting info is sharing borders with Oman and Saudi Arabia. The United Arab Emirates is a federation of seven emirates on the eastern side of the Arabian peninsula, at the entrance to the Persian Gulf. It has coastlines on the Persian Gulf of Oman and the Persian Gulf, with Saudi Arabia to the west and southwest, and Oman to the southeast and also on the eastern tip of the Musandam Peninsula as well as an Omani enclave within its borders. It is a country rich in history and culture and an easy starting point for travels in the Middle East. The landscape is flat, barren coastal plain merging into rolling sand dunes of vast desert and mountains in east. The average density of population is about 73 per km². The climate in United Arab Emirates can be described as desert with cooler in eastern mountains. Potential threats by nature are frequent sand and dust storms. To reach someone United Arab Emirates dial +971 prior to a number. The local cellular networks are operated on 900 MHz, 1800 MHz, 3G, 4G. Websites typically end with the top level domain ".ae". If you want to bring electric appliances (e.g. battery chaarger), keep in min the local 230 V - 50 Hz (plugs: G). The sign for the locally used currency Dirham is AED. 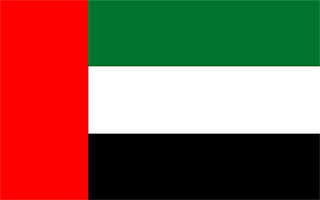 Three equal horizontal bands of green (top), white, and black with a wider vertical red band on the hoist side; the flag incorporates all four Pan-Arab colors, which in this case represent fertility (green), neutrality (white), petroleum resources (black), and unity (red); red was the traditional color incorporated into all flags of the emirates before their unification. The Trucial States of the Persian Gulf coast granted the UK control of their defense and foreign affairs in 19th century treaties. In 1971, six of these states - Abu Dhabi, 'Ajman, Al Fujayrah, Ash Shariqah, Dubayy, and Umm al Qaywayn - merged to form the United Arab Emirates (UAE). They were joined in 1972 by Ra's al Khaymah. The UAE's per capita GDP is on par with those of leading West European nations. For more than three decades, oil and global finance drove the UAE's economy. However, in 2008-09, the confluence of falling oil prices, collapsing real estate prices, and the international banking crisis hit the UAE especially hard. The UAE essentially avoided the "Arab Spring" unrest seen elsewhere in the Middle East in 2010-11 and in an effort to stem potential unrest, the government announced a multi-year, $1.6-billion infrastructure investment plan for the poorer northern emirates and aggressively pursued advocates of political reform. The UAE in recent years has played a vital role in regional affairs. In addition to donating billions of dollars in economic aid to help stabilize Egypt, the UAE is a member of a US-led global coalition to defeat the Islamic State in Iraq and the Levant (ISIL) and a coalition partner in a Saudi-led military campaign to restore the government of Yemen.